Remind me again, what year is this? 2017? Well, 16 years on, and Hollywood is still stuck at 9/11. Don’t get me wrong – I believe that the 9/11 attacks are one of the most significant events in modern history. However, I am sick and tired of how Tinseltown has painted the tragedy and its aftermath ever since. While the overtly nauseating patriotism displayed in these movies, and the lack of facts, might do well with the American public, for the rest of us, it’s just another way of how Uncle Sam – in cahoots with the influential Hollywood – wants to brainwash the world with an altered version of history. 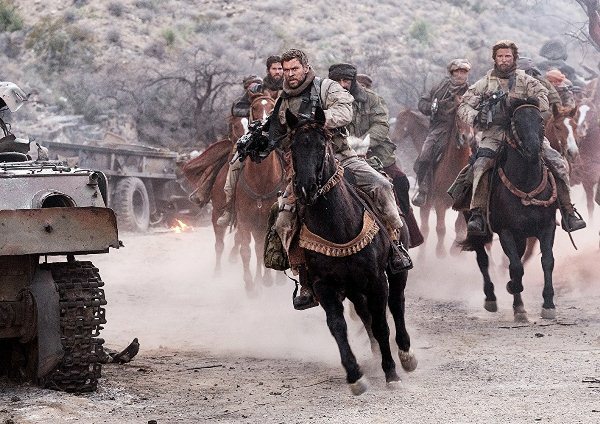 Based on Doug Stanton’s non-fiction book Horse Soldiers, the trailer for Nicolai Fuglsig’s 12 Strong has recently been released. Set in the immediate aftermath of 9/11, Task Force Dagger, a US Special Forces team led by Captain Mitch Nelson (Chris Hemsworth), is sent on a mission to Afghanistan to fight against the Taliban. Once there, they have to convince the Northern Alliance General Abdul Rashid Dostum (Navid Negahban) to join forces with them to take down the Taliban and its al Qaeda allies. But after overcoming mutual distrust in order to make an uneasy alliance, the team is handed a shock when they are told they’ll be riding horses into battle, owing to the country’s mountainous terrain. Outgunned and outnumbered, this band of 12, along with their equine friends, embark on this supposedly ‘just’ cause against a ruthless enemy in an alien territory. A fresh concept that immediately jumps at you upon watching the trailer is how the movie is about a US Special Operations force that is not called the Navy SEALs. 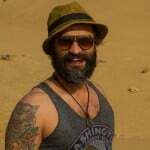 With ‘the Frogmen’ featuring in more than a dozen movies and TV shows in the past decade alone, they have long been an American media darling. So experiencing Green Berets, who are known for embedding themselves with indigenous militias for long periods of time to combat local threats, felt like an innovation of sorts. Speaking of ‘breaking the mould’, Hemsworth is back on our screens with a character that is completely different from his recent fantastical outings in Marvel’s Thor: Ragnarok, the Snow White and the Huntsman franchise and the rebooted Ghostbusters. 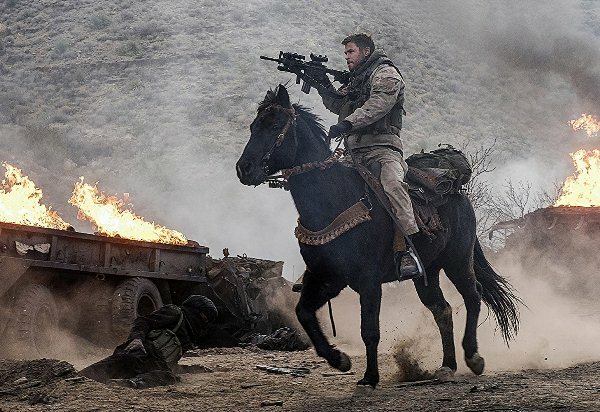 12 strong introduces us to a more human Hemsworth, who has got some realistic, real world stakes when it comes to war. Other than the aforementioned, the rest is all par for the course. Standard production values, standard set-pieces and standard dialogues. 12 Strong also somehow reminds you of Black Hawk Down, which shouldn’t be a great surprise considering Jerry Bruckheimer is one of the producers of the movie. Another film that comes to your mind when watching the promo is the classic Lawrence of Arabia, for obvious narrative reasons. Along with Hemsworth, 12 Strong also stars Michael Shannon, Michael Pena and Moonlight’s Trevante Rhodes. Also starring as Hemsworth’s wife in the movie is his real life spouse, Elsa Pataky. In recent years, January has sort of become a favourite month for opening Afghanistan war dramas. 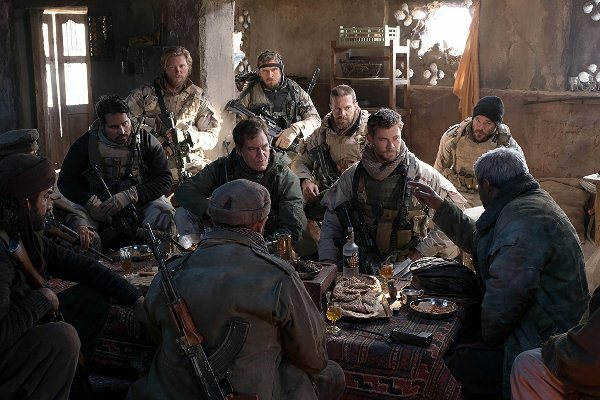 With Lone Survivor, American Sniper and 13 Hours: The Secret Soldiers of Benghazi, all releasing in the first month of the year, 12 Strong, releasing on January 19, 2018, looks set to join the club.